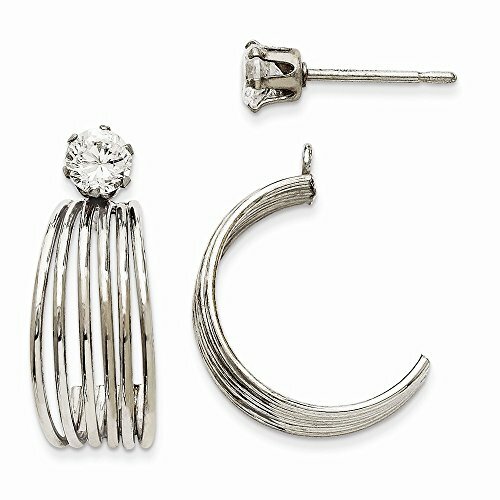 This adds a sense of charm to your favorite collection.14K White Gold Polished w/CZ Stud Earring Jackets. Model No. : XY1226. 14k White Gold. Product Type: Jewelry. Jewelry Type: Earrings. Material: Primary: Gold. Material: Primary - Color: White. Material: Primary - Purity: 14K. Length: 16 mm. Width: 8 mm. Thickness: 2 mm. Stone Type1: Cubic Zirconia (CZ). Stone Treatment1: Synthetic. Stone Creation Method1: Synthetic. Got questions about this item? If you wish to know any additional info or have any additional questions regarding this item, please don't hesitate to send us an email. We will answer any questions in a timely manner. Thank you. Please be sure to include the ASIN number of the product you are inquiring about in your message. Contact us as we may have them in stock. If you have any questions about this product by viStar, contact us by completing and submitting the form below. If you are looking for a specif part number, please include it with your message.